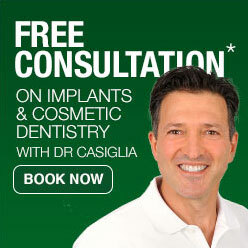 Dentist Lane Cove – Dr Mark Casiglia received his Bachelor of Dental Surgery with Honours from Sydney University in 1990. After a year and a half employed in private practice Mark found a small practice for sale in Longueville Rd, Lane Cove. Thus in 1992 the seed was planted that eventually became Apple Dental. After five years at Longueville Road, the space demands of a growing practice saw Mark join forces with another established local dentist to create the Lane Cove Dental Centre. To ensure his patients continued to receive the best possible individual attention, Mark took care to maintain a separate practice within the centre. After ten years at Lane Cove Dental Centre, Mark had grown his business even further, to the point where a standalone practice was now a necessity. And so in 2007, the brand new Apple Dental was born – a practice designed and built specifically to provide progressive dentistry in the heart of Lane Cove. Mark has always believed in staying up-to-date with modern dentistry techniques. This passion for innovation was on display in 2000, when he became one of the first Australian dentists qualified to offer one-hour teeth whitening. 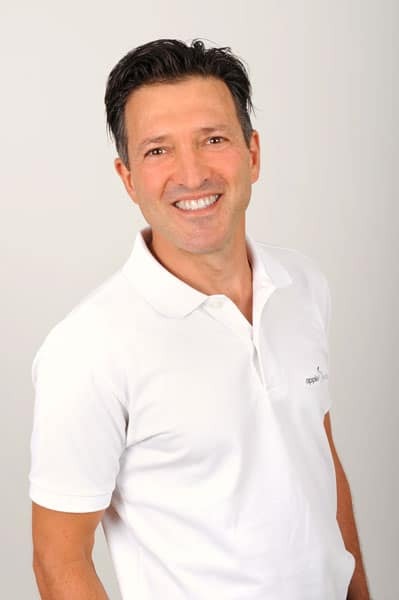 And in 2002, Mark was among the very first handful of Australian dentists to practice laser dentistry, paving the way for many new and improved treatments for our Apple Dental patients. During this period, Mark’s reputation as a leader in cosmetic dentistry continued to grow. He made several appearances in magazines, and was featured in two national Sunday newspaper interviews. Mark was the subject of two ABC current affairs television interviews, a Vogue Magazine article and several interviews in Australian Dental Practice Magazine. With the addition of implant dentistry to his skill set in 2005, Mark was now able to offer permanent, natural-looking replacements for missing teeth. By combining this new ability in implant dentistry with his expertise in gum treatment and complex restorative and cosmetic dentistry, Mark now had the ability to offer full-mouth rehabilitation, to provide solutions to almost any situation his patients present with. With the acquisition of the new CEREC 3D CAD/CAM system in 2008, Mark could now provide fully computerised, chair side design and creation of porcelain dental crowns, inlays and onlays. Apple Dental’s patients now benefit from being able to receive restorations in just one visit – with no temporary fillings or impressions needed. Even though Apple Dental offers the most advanced dental technology for its patients, Mark has always placed a great deal of emphasis on creating a warm and welcoming atmosphere for everyone who walks through our doors. Over the years this has earned him a loyal following in the local community, with patients who know they can trust Mark and his team to look after them and to always provide excellent care. Regular patients are well aware that Mark always strives to achieve exceptional results, no matter the treatment provided. When not at Apple Dental, Mark loves to play sports as it is important to him to remain healthy and active. He plays with and manages AFL with the Lane Cove Cats and you may also see him out and about on the local golf courses. A keen supporter of the Sydney Swans, Mark’s other interests and hobbies include scale model building and the violin. As proud local residents of Riverview in the Lane Cove area, Mark and his family are active members of Apple Dental’s local community. Today, Mark remains committed to his patients’ wellbeing and enjoys the opportunity to be part of their society. Give us a call on (02) 9420 5050 to schedule an appointment with Mark. We are located at 1 Finlayson St, Lane Cove NSW 2066.